super deli mart | Beer Blotter: Seattle based. World focused. 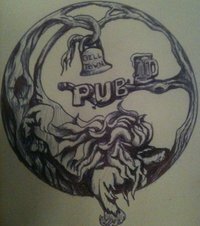 Belltown Pub: My New Hood Haunt? This logo is pretty slick. So this is now the third time that I have ventured into thoughts on the new Belltown Pub. But when something new opens in Belltown, pouring decent beer, you have to bet I will have an opinion. Back in June, I did a short article about the return of the Belltown Pub. Back at that time, there was some hope that the Pub would be up and running by July. Well, it didn’t happen – but they did finally open the doors last Friday, August 20, 2010. I got in to see them on Saturday. That Saturday was quite an adventure for myself, who visited the Fauntleroy area of West Seattle. After finishing a mini-triathlon, I decided to bike around and visit some places that eluded me over the past few years. First, a stop at Super Deli Mart for a hoagie and pint of Elysian Brewing’s BiFrost – all for about $9.00! Later on, I biked on over to Big Al’s Brewing to sit on the patio in the sun and enjoy a few pints of the rare stuff – Alt bier and Trippel. More on these two places, later this week. After Big Al’s, I decided to head back to the mayhem that was Belltown last weekend. If you didn’t know, Hempfest took over the city last weekend. Pure honesty: I don’t like this event. Every year someone vomits and passes out in front of our door and a gobs of others break windows, piss in our alley and generally litter the grounds. Its something we try and avoid. But, with the launch of the hood’s new digs, I had to return. The result: I like it. Belltown Pub is essentially a carbon copy of the old Belltown Bistro, as far as the layout and improvements. The new owners were wise to keep the layout, as it facilitates good food service and dining. But, they made two important changes: (1) changed the decor and paint and (2) pushed the bar area back into the dining area some 2′ feet. The new Pub has a very nice “woody” or aged feel to it. Tones of green and brown gravitate towards the classic fisherman’s pub look and feel. Moving the bar back a few feet was a move of pure genius. It allows the bar goers more room and some distance from the diners – giving them a feel of their own separate habitat. The beer is above average. One of the owners is Dave. Dave is a beer man, and he was wise to understand that Belltown does not have much rotation. With the exception of Buckley’s Tavern (which is generally packed to the brim), none of the bars in the area change out what they are pouring. You might see some good taps (Two Bells has Scarlett Fire, Cyclops has Boundary Bay One-Eye PA, and Frontier Room has Union Jack IPA), but they simply do not change. Dave promises routine rotation of almost all of the taps (exception given to PBR and Guiness, of course) and their initial offerings promised great things ahead. On tap for Saturday was Fremont Brewing’s Interurban IPA, Skagit River’s Washington Wheat, Bridgeport’s Hop Czar, Georgetown’s Chopper Ale, and several other fine micro ales. With only 9 taps, I was very excited to see that two were devoted to a couple impressive IPAs. Dave knows his crowd will feverishly crave the hop goodness. The menu is excellent. Much more impressive than the beer selection, is the impeccable selection of intriguing food options that you seldom see at other places. While I was there, I dared to say it was the best bar menu I have seen since Avenue Pub in New Orleans (our personal favorite). I might not back off that comment, either. Where else do you see house-smoked salmon tamales, muscovy duck salad sandwiches and duck stew? Also, they have wings – my personal weakness. Even better, the wings are created by a former Wing Dome master and served in large portions. So, we are raring up for a full visit that will undoubtedly end up in 52 Weeks. But for now, I wanted you all to know the goods. With 7 or 8 plasma TVs and the NFL package, why not stop bye for a game, an IPA and some wings! I still cannot locate a website for the new Pub, but they do sport a fine Facebook page. If you make it in to the Pub, please let us know about your experience below in the comments.